The expressions we develop will allow us to define a particular mission and then determine the optimum component characteristics (e.g. compressor, combustor, turbine) for an engine for a given mission. Note that ideal cycle analysis addresses only the thermodynamics of the airflow within the engine. It does not describe the details of the components (the blading, the rotational speed, etc. ), but only the results the various components produce (e.g. pressure ratios, temperature ratios). In Chapter 12 we will look in greater detail at how some of the components (the turbine and the compressor) produce these effects. where , , , , , and . To identify individual stations within the engine we will use the numbers in Figure 11.12. Figure 11.12: Gas turbine engine station numbering. Compressor or fan: , . 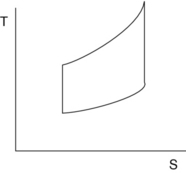 The ratios of stagnation to static pressure at exit and at inlet are the same, with the consequence that the inlet and exit Mach numbers are also the same. The fuel-air ratio, , depends on the fuel properties ( ), the desired flight parameters ( ), the ramjet performance ( ), and the temperature of the atmosphere ( ). We wish to explore the parameter dependency of the above expression, which is a complicated formula. How can we do this? What are the important effects of the different parameters? How do we best capture the ramjet performance behavior? A plot of the performance of the stoichiometric ramjet is shown in Figure 11.14. The figure shows that for the parameters used, the best operating range of a hydrocarbon-fueled ramjet is . The parameters used are , in the stratosphere, for hydrocarbons, such that . Examined and as a function of . Figure 11.15: Schematic with appropriate component notations added. Find thrust by finding in terms of , temperature ratios, etc. 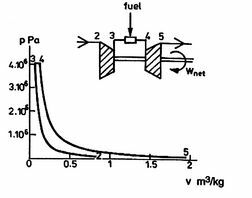 Use an energy balance across the combustor to relate the combustor temperature rise to the fuel flow rate and fuel energy content. We now continue on the path to our expression for . Now we have two steps left. First we write in terms of , by noting that they are related by the condition that the power used by the compressor is equal to the power extracted by the turbine. Second, we put the burner temperature ratio in terms of the exit temperature of the burner, ( or more specifically ) since this is the hottest point in the engine and is a frequent benchmark used for judging various designs. That was the first step relating the temperature rise across the turbine to that across the compressor. The remaining step is to write the temperature rise across the combustor in terms of . Our final step involves writing the specific impulse and other measures of efficiency in terms of these same parameters. 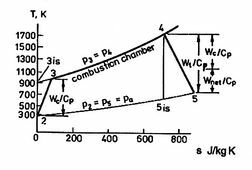 We begin by writing the First Law across the combustor to relate the fuel flow rate and heating value of the fuel to the total enthalpy rise. into the equations before plotting the results in Figures 11.16, 11.17, and 11.18. 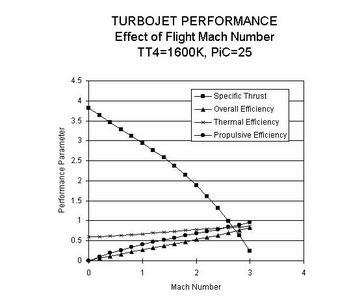 Figure 11.16: Performance of an ideal turbojet engine as a function of flight Mach number. Figure 11.17: Performance of an ideal turbojet engine as a function of compressor pressure ratio and flight Mach number. 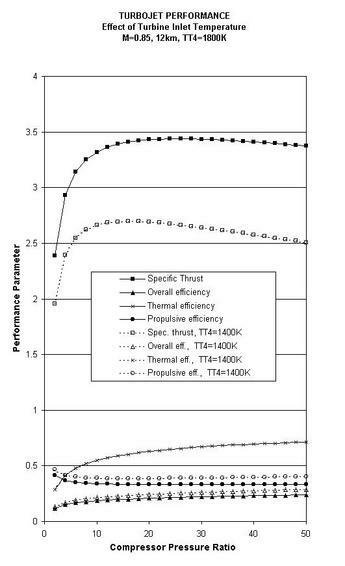 Figure 11.18: Performance of an ideal turbojet engine as a function of compressor pressure ratio and turbine inlet temperature. To conclude this chapter, we will now improve our estimates of cycle performance by including the effects of irreversibility. We will use the Brayton cycle as an example. What are the sources of non-ideal performance and departures from reversibility? 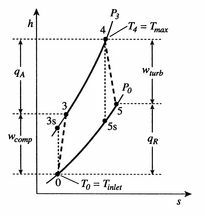 Losses (entropy production) in the compressor and the turbine. Stagnation pressure decrease in the combustor. We take into account here only irreversibility in the compressor and in the turbine. Because of these irreversibilities, we need more work, (the changes in kinetic energy from inlet to exit of the compressor are neglected), to drive the compressor than in the ideal situation. We also get less work, , back from the turbine. The consequence, as can be inferred from Figure 11.19, is that the net work from the engine is less than in the cycle with ideal components. again for the same pressure ratio. Note that for the turbine the ratio is the actual work delivered divided by the ideal work, whereas for the compressor the ratio is the ideal work needed divided by the actual work required. These are not thermal efficiencies, but rather measures of the degree to which the compression and expansion approach the ideal processes. We now wish to find the net work done in the cycle and the efficiency. The net work is given either by the difference between the heat received and rejected or the work of the compressor and turbine, where the convention is that heat received is positive and heat rejected is negative and work done is positive and work absorbed is negative. We need to calculate , . 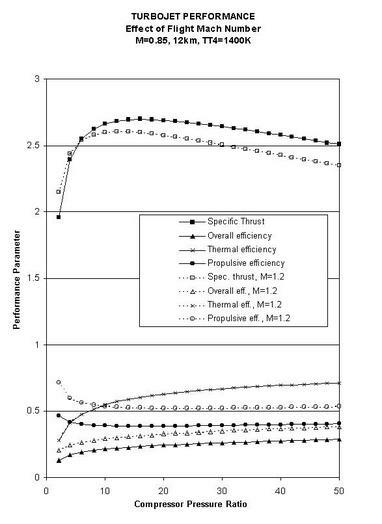 There are several non-dimensional parameters that appear in this expression for thermal efficiency. We list these in the two sections below and show their effects in accompanying figures. For any , the optimum pressure ratio for maximum is not the highest that can be achieved, as it is for the ideal Brayton cycle. The ideal analysis is too idealized in this regard. The highest efficiency also occurs closer to the pressure ratio for maximum power than in the case of an ideal cycle. Choosing this as a design criterion will therefore not lead to the efficiency penalty inferred from ideal cycle analysis. There is a strong sensitivity to the component efficiencies. For example, for , the cycle efficiency is roughly two-thirds of the ideal value. The maximum power occurs at a value of or pressure ratio less than that for max (this trend is captured by ideal analysis). The maximum power and maximum are strongly dependent on the maximum temperature, . A scale diagram of a Brayton cycle with non-ideal compressor and turbine behaviors, in terms of temperature-entropy ( - ) and pressure-volume ( - ) coordinates is given below as Figure 11.21.